A Micro VG Repaint Kit is a complete replacement kit sold at a reduced price. The Repaint kit contains everything that was in the original kit except for the STC and Strakes (if applicable to your model). It is sold ONLY for aircraft serial numbers that have previously been fitted with one of Micro AeroDynamics Vortex Generator STCs for the reinstallation of the VGs during paint or damage repair. The Micro VGs are shipped Alodined ready for paint. Most original installations are done on top of existing paint, and during the installation process, the paint is abraded slightly in the area to be glued, prior to gluing the VG. Since the vortex generators are glued to the paint, when a customer goes to the paint shop and the aircraft is stripped, the VGs usually come off. Installation of Alodined VGs can be made directly onto the alodine surface of the aircraft and painted in place during the repainting process, or painted off the aircraft at the same time as the plane is painted (See -- Painting Tips ), then reinstalled on top of the paint after appropriate cure time. 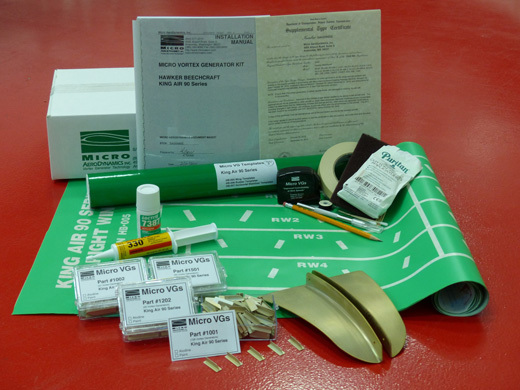 Micro VG repaint kit is a convenience for the customer – not a requirement. There is nothing in the STC that precludes the customer from cleaning up the removed VGs and re-installing them with Loctite® 330™ Depend® Adhesive and locating them on the aircraft using the drawings that were contained in the original kit.